Wondering about the health benefits of apples? Discover the many and varied benefits of apples, learn some facts about apples and you will enjoy them even more in your raw diet. Yes, we have all heard the maxim, “An apple a day will keep the doctor away.” While an apple cannot cure EVERYTHING, the truth is that the benefits of apples are exceedingly wide-ranging. So much so, that I heard one health enthusiast proclaim apples as "the perfect fruit.” Don't underestimate the humble apple, the benefits of apples for general health are many. Here are some general, health-related facts about the health benefits of apples. And here's a side note: To get the most out of your apple, eat the peel and the seeds. Alzheimer's – The antioxidant quercetin which is found abundantly in apples protects the brain against oxidative stress. A study reported by Science Daily showed that apples may help with neurodegenerative disorders including, but not limited to, the dreaded and feared Alzheimer's disease. So if you remember to eat an apple or more a day, you may not forget other just as important things. Asthma and Allergies – A study reported by the American Journal of Respiratory Critical Care Medicine credits the flavonoids in apples to protect and reduce the symptoms of allergies and asthma. If you are prone to either of these discomforts, an apple (or more) an day may help you breath easier. Bone Health – Apples are the only fruit that contains flavonoids called “phloridzin.” This compound helps to increase bone density, which may help protect against osteoporosis. Cholesterol – Eating two apples per day can significantly lower your cholesterol according to the study conducted by the Irish Journal of Food Science. Diabetes – Although apples are very high in natural sugar, the properties of apples prevent the body from releasing too much insulin, making apples a low glycemic food. Apples contain galacturonic acid, which lowers the need for insulin and helps in the management of diabetes. Sprinkle your apples with cinnamon for even more help with diabetes. Oral Care – I was told in grade school that if you cannot brush your teeth, eat an apple. 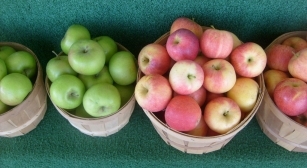 Apples have natural acidic resources that help maintain the cleanliness of teeth and breath. When we eat an apple, the fiber cleanses the teeth while antiviral properties help keep away viruses and bacteria. Weight Loss – The fiber and high water content in apples helps you to feel fuller. I read about a person who said he lost 30 pounds by simply eating an apple before his regular meals. In an apple there is an antioxidants called “polyphenols,” which help to control body fat. Apple Seeds – Harmful or Helpful? While many think that apple seeds are poisonous since they do contain a trace amount of cyanide, they also contain a very helpful nutrient, dubbed Vitamin B17. So the health benefits of apples even continue into the core! Apples and your dehydrator work well together. Pre-treat thinly sliced apples in a solution combining fresh lemon, lime or pineapple juice and water, using a 1 part juice to 4 part water rinse. Arrange the apple slices in a single layer on the dehydrator trays. The apples are dry when you cannot squeeze out any moisture. For best storage of your dried apples, pack them in plastic freezer bags and keep them in your freezer. For more information on how to dehydrate apples and other fruits read the article How to Dehydrate Fruit.